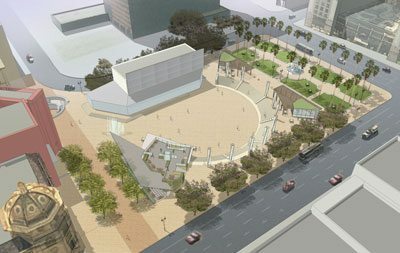 Based largely on feedback from two public forums thus far, a single, preferred design has been selected on which to base the redevelopment of Horton Plaza and adjoining Horton Plaza Park. The winner: the Cabrillo Arch plan. It was one of three concepts presented to the public June 21, when the last forum was held. The other design concepts included The Forum, a more traditional and rectangular design, and Land Form, which fed off the angles of nature for its inspiration. Featuring an arched amphitheatre-style plaza with an off-center interactive water feature, Cabrillo Arch — reminiscent of the arch on the old Cabrillo Theater — will likely still not be the final say, as yet another public forum is scheduled for July 26. As with the other two plans, it includes a variety of public ideas, vendor kiosks, glowing luminaries, restrooms, solar panels and large open space for the more than 200 events promised to be held there every year by its future manager, Westfield. Westfield will manage the city-owned property for 25 years through a $35 million development agreement with CCDC, which will pump more than $8 million of redevelopment money from the Horton Plaza redevelopment zone into the design of the new plaza. Plans for Horton Plaza Park include a restoration to its historical state circa the late 1800s. The July 26 forum will be the last in a series of public workshops on the redevelopment project, and the last opportunity for the public to provide feedback before a final concept is adopted. Once adopted, the final concept will be presented to and considered by the CCDC Board Of Directors in September. The meeting will be held from 6 to 8 p.m. in the former Robinsons-May building at 97 Horton Plaza , which will eventually be torn down to make way for the new plaza. A presentation by the Portland, Ore.-based design team of Walker Macy will be given at 6:15 p.m. If the plaza is managed by the shopping center, does that mean the plaza will no longer be a space for free speech? who’s footing the bill ?if the city is,ithought they were broke!just like the county ,they say they are broke but plan to install a homless water park down by the star of india.so the board of stupidvissors can leave a legacy to their tenure.ok i’m gettin sick now. If Doug would have read the article, rather than spouting red-state nonsense without use of proper punctuation and spacing, he would have seen that the estimated cost would be around $8 million to be funded by Westfield and Center City Development Corp’s tax revenues from the Horton Plaza redevelopment project. Since you are commenting on an Ocean Beach site, ill assume that you live in OB which means this doesn’t concern your wallet at all. The sickness you feel might be the strain from reading something that doesn’t involve the Berenstain Bears. I hope it all works out. It would be a great space and a real public asset to our beautiful city. I encourage people like Doug to move to someplace like Iowa, if they are really that dissatisfied. That, or run for public office and change things… which may be difficult without proper use of capitalization.